The firearms and explosives were recovered in a planned search operation following Friday’s €1.5m cannabis resin haul. A Defence Forces EOD team was dispatched to Limerick after a number of hand grenades were found this morning. GARDAÍ IN LIMERICK investigating the recovery of cannabis resin worth €1.5 million in Limerick on Friday night have recovered explosives and ammunition in a follow-up raid. Gardaí this morning carried out a planned search on a premises in the city, recovering a quantity of hand grenades, two pistols, and around 400 rounds of ammunition. 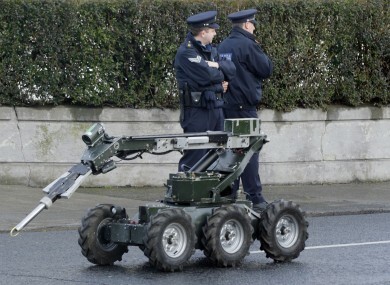 An Explosives Ordnance Disposal team from the Defence Forces was deployed to the scene. The two men arrested in connection with Friday’s haul of cannabis resin were remanded in custody at a special sitting of Limerick District Court earlier this afternoon. Email “Gardaí recover grenades, pistols and ammunition in follow-up Limerick raid”. Feedback on “Gardaí recover grenades, pistols and ammunition in follow-up Limerick raid”.